French journalist Loup Bureau, who was released after 52 days in detention in Turkey, arrived in Paris on Sunday, said his six days spent in police custody were “complicated,” while his father explained that Bureau was “physically and psychologically abused” under custody, Le Monde reported. 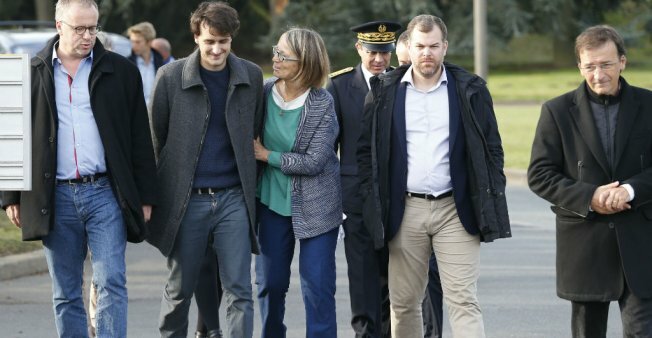 Welcomed at Roissy-Charles de Gaulle Airport on Sunday morning by family members and supporters including French Culture Minister Françoise Nyssen and his father Loic Bureau, the 27-year-old journalist said he was very tired and very relieved to have returned. “I was not physically mistreated, but there were threats and intimidations. I was in custody for six days before going to prison. That was when it was more complicated,” Bureau told the media at the airport. “In the week of custody, he was treated like the Kurdish prisoners, so he was physically … and psychologically abused. From the time he was in prison, things became more normalized,” Le Monde quoted Loic Bureau as saying. The journalist added that after French President Emmanuel Macron asked for his release, his treatment by the prison guards changed. “We are pleased to announce the release of journalist #LoupBureau. He will be expelled from Turkey shortly,” Martin Pradel, the lawyer for the journalist, tweeted out on Friday, right after a court in Şırnak ruled to release and deport Bureau. Bureau was detained on July 26 near the Iraqi border while he was preparing a report on the Kurdish issue and what life is like for the local population. He was arrested on Aug. 1 for aiding and supporting the Syrian Kurdish People’s Protection Units (YPG) and taken to a prison in Şırnak province. French Foreign Minister Jean-Yves Le Drian called on Turkey’s government at a Thursday news conference in Ankara to show respect for European Union values and called for a swift trial for Bureau. “I have underlined the importance of returning to a more conciliatory exchange concerning [Turkey’s] relations with certain European nations so that we may concentrate efforts on problems that we face,” Le Drian said. On April 9, Gabriele del Grande, an Italian journalist working for the ANSA news agency, was detained during a security check in the southern province of Hatay. He was released by a Turkish court on April 25. Del Grande was interviewing Syrian refugees for a book he is writing about the war and the rise of the Islamic State in Iraq and the Levant (ISIL). Last November another French journalist, Olivier Bertrand, was detained in the southeastern province of Gaziantep and deported three days later following the diplomatic efforts exerted by Paris. In the last days of 2016, Wall Street Journal correspondent in İstanbul Don Nissenbaum was held incommunicado for over two days for tweeting about an alleged soldier burning by ISIL. In January The New York Times reported that Turkey denied entry to one of its veteran reporters, Rod Nordland, at İstanbul Atatürk Airport, with no reason offered by officials as to why he was not allowed to enter the country. Deniz Yücel, who works for the German Die Welt newspaper and has been kept in pre-trial detention in Turkey since Feb. 27 as part of an investigation for publishing stories on the leaked emails of President Recep Tayyip Erdoğan’s son-in-law and Energy Minister Berat Albayrak, was arrested by a court on Feb. 27. In April, the Turkish government refused to renew the press accreditation of German Stern magazine reporter Raphael Geiger due to alleged remarks insulting Erdoğan. Two Swedish journalists were also temporarily detained by police in November of last year in the southeastern Kurdish province of Diyarkabır. Lindsey Snell, an American freelance journalist detained by Turkish security forces on Aug. 7, 2016 as she crossed into Turkey from Syria and accused of having illegally entered a restricted military zone, was released in October after two months’ detention in Turkey. Finnish journalist and writer Taina Niemela was deported from Turkey in April 2016 on charges that she had been involved in “spying activities. Selin Girit, a host on the BBC’s Turkish service, was another journalist targeted by Erdoğan, who said, “Part of a conspiracy against her own country.